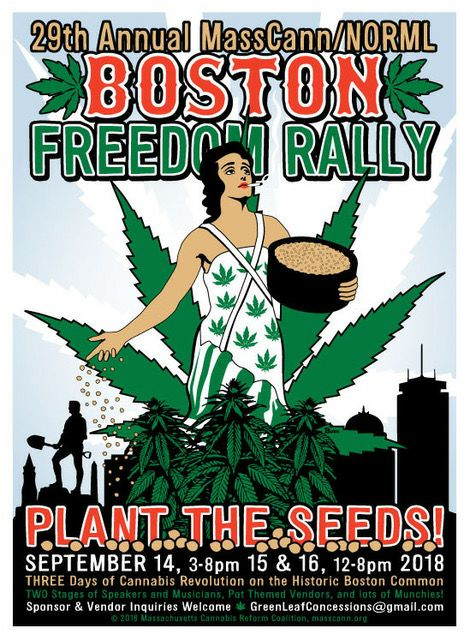 The 29th Boston Freedom Rally is the largest annual gathering of pro-marijuana supporters on the East Coast and the second largest festival of it’s kind in the world, surpassed only by Seattle’s Hempfest. So if you find yourself near the Boston Common this weekend that hazy cloud hanging over the Common isn’t a weather pattern and is likely to make your head spin if you walk through the park. The rally officially kicks off this afternoon but is typically attended by most over the weekend from 12-8PM on Saturday and Sunday. The rally is organized by the Massachusetts Cannabis Reform Coalition (MassCANN), the state affiliate of the National Organization for the Reform of Marijuana Laws (NORML) also known as MassCann/NORML. I’ll stay off the road, thanks, because they’ll be free to drive, unless they can all be ticketed for DUI. Sure puts a crimp in smoking laws, doesn’t it, after we have spent decades getting people to stop?